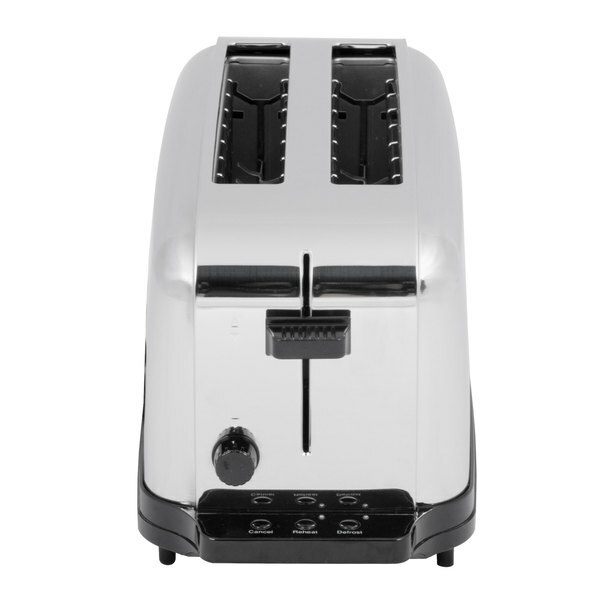 The Waring WCT704 4 slice NSF commercial toaster stands out on any counter top or serving area. 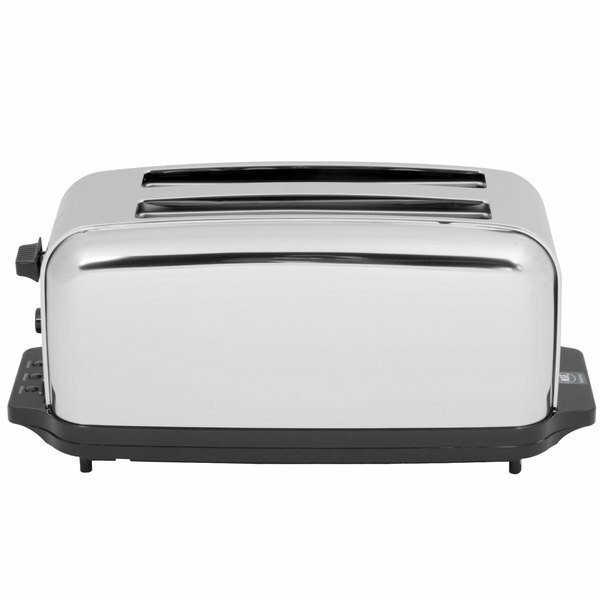 Toast efficiently and conveniently with the Waring WCT704 4 slice commercial toaster. Designed with attractive mirror-finished, chrome-plated steel, the unit is a stunning installment for any kitchen, and its easy operation guarantees its place as an irreplaceable food prep workhorse. 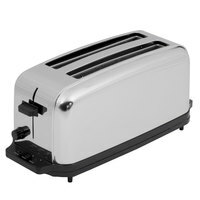 It features 4 slots to accommodate 4 slices of bread at a time, as well as an array of convenient features to simplify toast production. "Wonderful warring for slice commercial toaster. High-quality and well-designed. This should last us a long time, even under daily use and heavy stress. 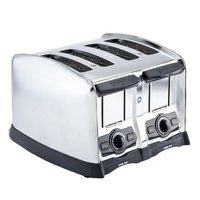 Love the offer price"
Its two extra-long slots enhance the toaster's versatility by enabling you to toast two long slices of bread, such as Italian, or four regular slices of bread or English muffins! 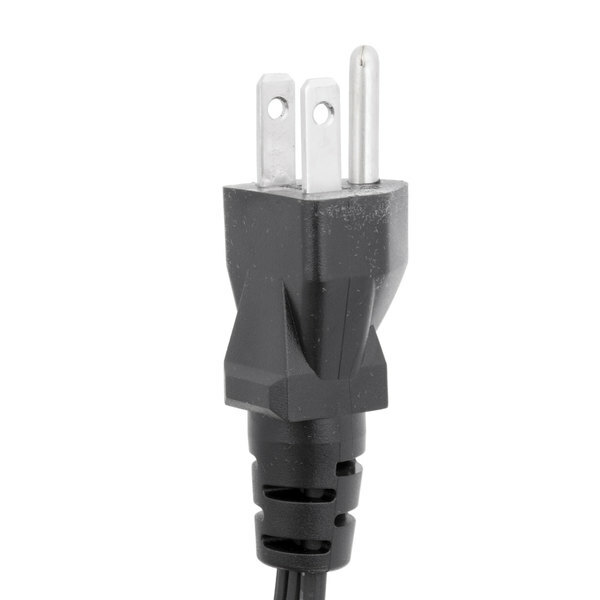 Both slots are 1 3/8" wide to accommodate a variety of products. The browning level can be adjusted using the easy-to-grasp rotary dial, while the convenient touch controls offer three specialized functions. Plus, the defrost function defrosts and then toasts frozen bread with the touch of a button. For optimal convenience and versatility in the kitchen, bread can be reheated without browning. You can also press the cancel button to interrupt toasting and return the carriage to the top. 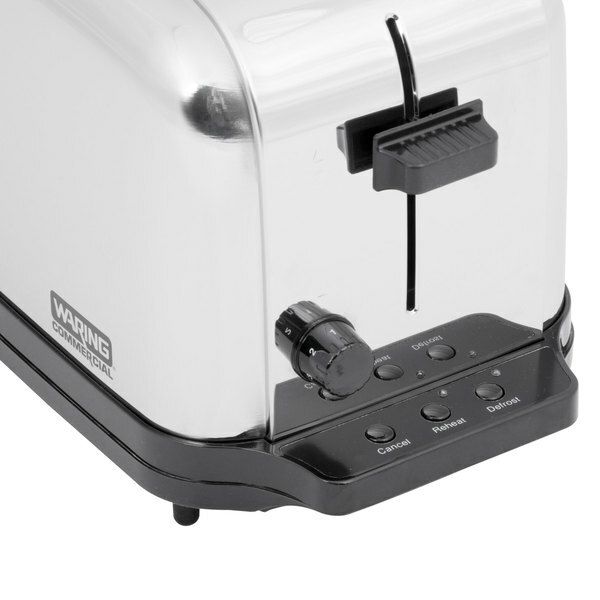 This Waring WCT704 NSF commercial toaster also features a self-centering bread rack to ensure that thinly sliced bread is evenly toasted or warmed. A pull-out crumb tray enables easy crumb removal. 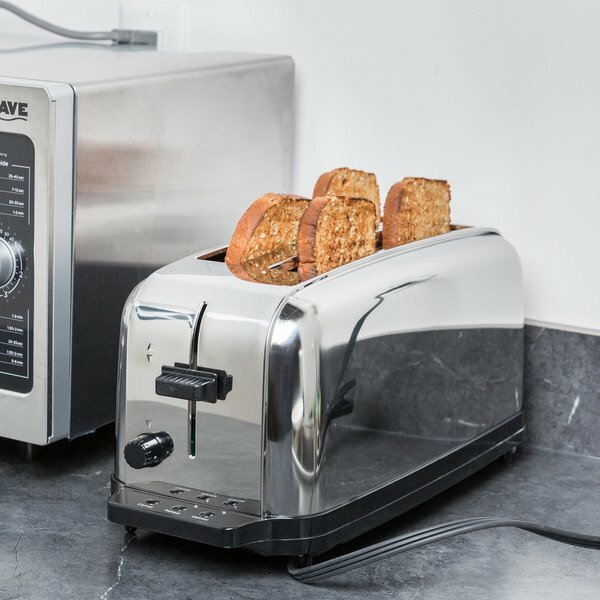 How can I safely remove crumbs from a toaster? 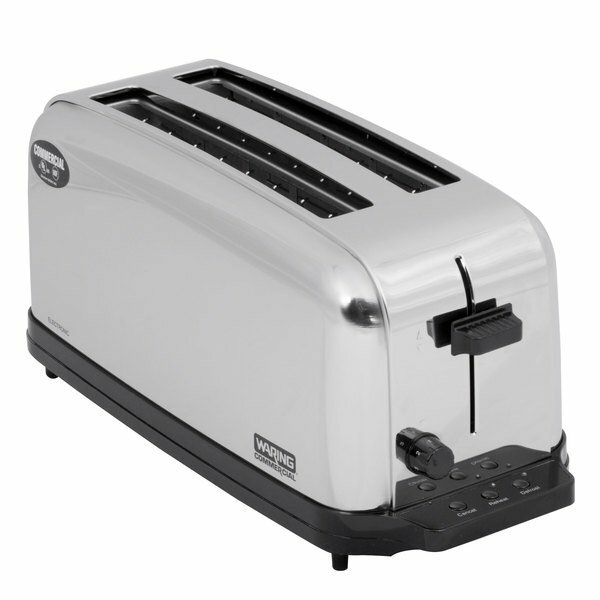 Most toasters have a tray at the bottom where the majority of crumbs will fall. 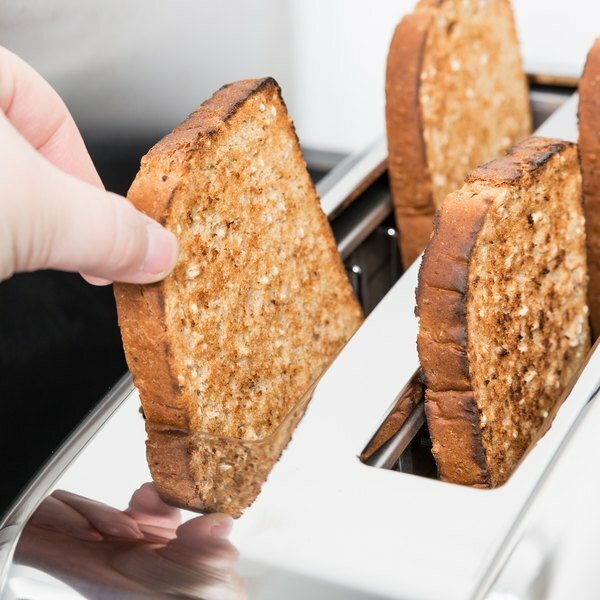 Remove the toaster’s crumb tray, empty all of the loose crumbs and wipe the tray clean, making sure it’s dry before replacing. Do not turn the toaster upside down or shake to remove crumbs. This can be damaging, loosening internal components and further lodging crumbs inside of the toaster. 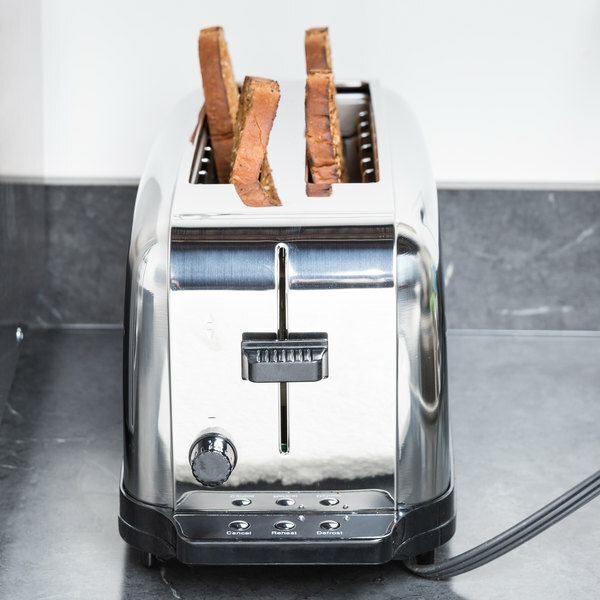 Shaking a toaster can also cause the lever not to work over time. Learn about the features, controls, and uses for the Waring WCT704 commercial toaster! The Waring WCT704 toaster is a great way to step up from a residential toaster to one that’s truly commercial. Two extra-long slots will fit four regular pieces of bread, but also allows you to use two long slices of bread as well. An easy to use toasting lever allows for speedy operation. Reheat, defrost, and cancel functions let you pick the perfect setting with just one touch of a button. The Waring WCT704 toaster is UL and NSF certified to meet top sanitation and food safety standards. An electronic browning dial make it easy to precisely control browning. Cleaning your toaster is a breeze thanks to this removable crumb tray. 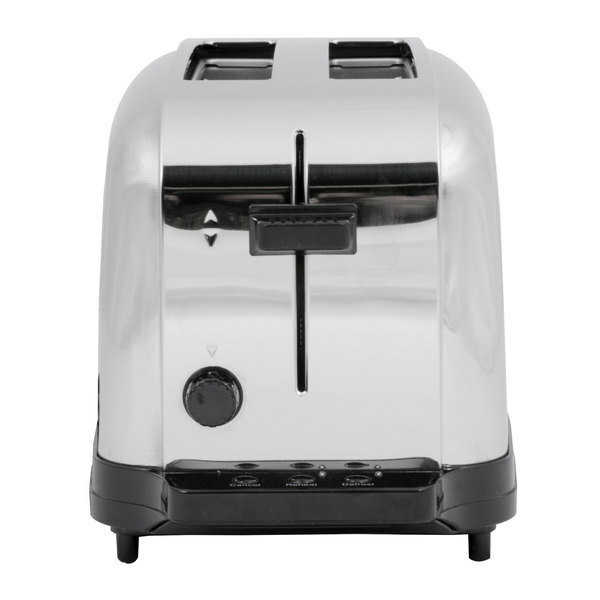 This versatile toaster is great for toast, bagels, English muffins and other specialty items! 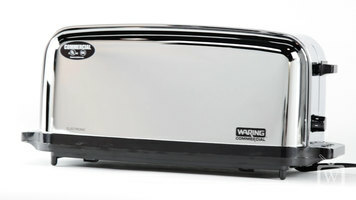 Be sure to check out the WEBstaurant Store’s entire line of Waring commercial toasters! Parts are subject to a 90 day warranty. All warranty claims are subject to manufacturer discretion. Warranty is not valid on any product leaving the U.S.
Great toaster! We use this for our longer breads, makes great toast, and can fit 4 slices easily of pan baked bread, does a great job of toasting up our levain that is very long too. Lots of daily use, holding up well. We have had this toaster in service for several months now with no issues. Perfect size that will hold panini sized bread slices with no issue. This toaster is must have! It is large so you can use an size of bread. It is well build. and it is also very fast! Was looking for a good and inexpensive toaster. Home units do not work well . This unit is commercial and NSF approved and have a good warranty. 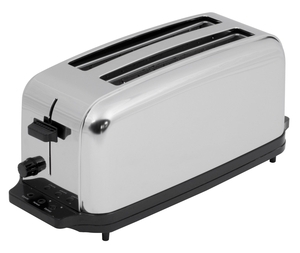 This toaster is good because it has two extra long slots that allow not only for 4 slices of bread but allow you to toast unusually large slices as well! Great for homemade bread!!! There is nothing really special about the toaster, but it is efficent. I am happy enough about the purchace. we cannot say enough great things about the webstaurant store.